Can you talk about what’s happening in the video? What about the kid that was filming it? Why do you think that he shouldn’t fight back? Why do you think that people become bullies? If this was happening in your school in the video and you came across it what do you think you would you have done? What do other kids do usually when they see other kids being bullied? Why is that a brave thing? You’ve heard of cyber-bullying. What is that? How can you help stop cyber-bullying? And it that the same as regular bullying? Is it worse? Is it better? What does your school do to educate you guys about bullying? the school suspended the bully for 21 days and suspended the kid being bullied for four days. Do you think that’s fair? And do you think bullying will ever completely go away? What would you say to the kid that was getting picked on if you could talk to him? What do you want to say to all the bullies of the world? 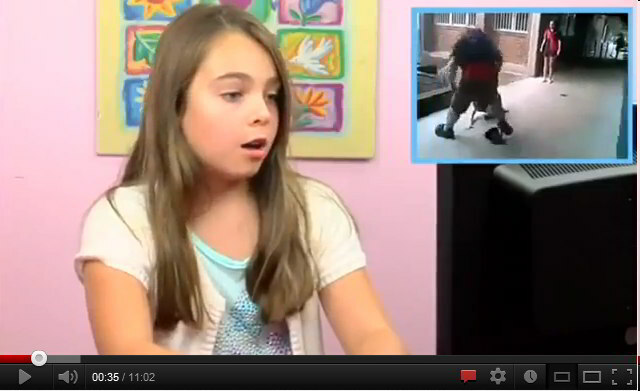 Here’s the original Fine Brother’s ‘Kids React to Bullying’ video.